ScreenSteps Desktop 2.9 and Workgroup DocumentationScreenSteps Desktop & WorkgroupScreenSteps 2.9 Exporting and TemplatesHow Can I See Which Web Servers I've Uploaded a Lesson To? 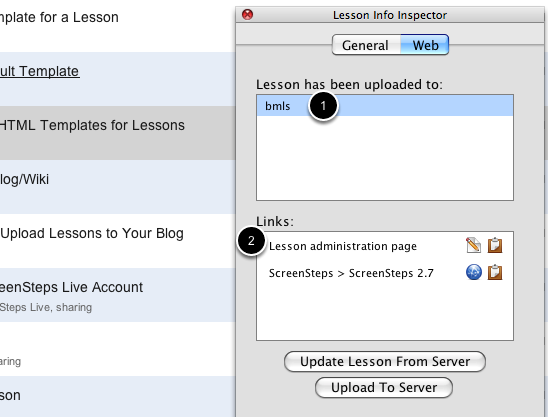 This lesson will show you how to see which web servers you have posted a lesson to. 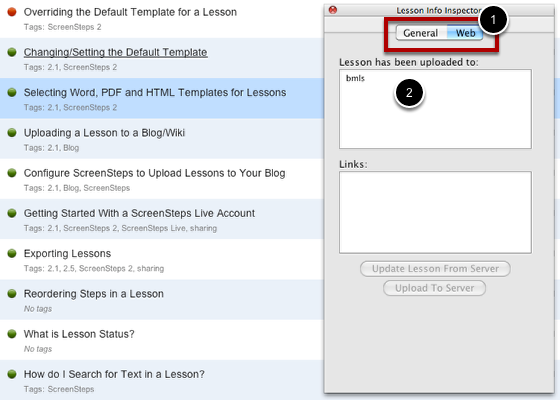 The Lesson Inspector has a Web tab (1) that shows which of your Web Export accounts the selected lesson has been uploaded to (2). Clicking on a web export account (1) will list links to that lesson on the web server (2). You can use the icons to the right of the link name to view the lesson in your browser (1) or copy the url to the lesson to the clipboard (2).